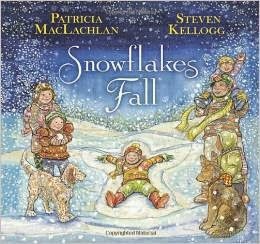 Snowflakes Fall by Patricia Maclachlan and Steven Kellogg. A poetic romp in the snow by two children's lit talents as our guides. Written in honor of the children and families at Sandy Hook. Recommended by the PlanetEsme Plan. Link for information, please support your local independent bookseller.